Acrylic paint in red, black and white. Due to the availability of different size spools and beads the measurements are not exact. The small bead is one quarter the size of the head bead. The small spools should be half the size of the large spool. With these directions you can make your spool angel as large or as small as your available material. 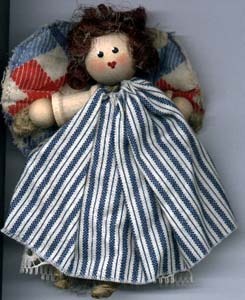 The fabric for clothing and the wings would need to be adjusted to the size of your finished spool doll. Fold your jute cord in half. Leaving a small loop as a hanger tie a knot. Insert both ends of the jute through the bead and one of the large spools. Tie a single knot. Separate the two pieces of jute stringing one through two small spools into one end of the small wooden bead and back through the two spools to the center to form an arm. Repeat this with the other arm. Add another knot and trim the jute. A small amount of craft glue placed on the knot will help to hold it. Using the handle of your paint brush place two black dots for her eyes and three red dots, two side by side, one below and between the first two forming a heart shape mouth. Allow to dry. With a toothpick place two white dots for highlight in the upper left quarter of your black eye dots. A small amount of pink blush on a cotton swab can be added to her cheeks. Place glue on her head in the area of her hair being sure to pull the hanger loop up out of the way. Add the doll hair and press it into the glue forming her hair do. Run a gathering stitch along the top edge of the lace/eyelet petticoat. Gather this tightly and place around the top large spool. Push it firmly up to the very top of the spool and tie off. A small amount of glue added under the gathers will help hold it in place. On the dress fabric fold the length in half and then in half again. Cut a small slit on the one fourth fold of the fabric from the open ends on each side. Place the slits one on each side of the top spool leaving the arm sticking out. Then run a gathering stitch along the top of the dress fabric from the back over the first arm, across the front over the second arm and across the second back piece pulling it up tight and tying it off at the center back. This will form the dress with the collar portion right under the head bead. (there is no need to sew the back seams as once the wings are added the opening is not visible.) This is a country look angel so it is not necessary to hem the gown. Fold your cutter quilt fabric in half and cut out as large a heart as will fit. You can machine stitch around the edge of the heart 1/8" or buttonhole/blanket stitch around the edge. Glue the heart to the angels back (running a thin line of glue down the center of the heart for the hearts full height). The hanging loop is her halo. Option:You can trim the loop off at the top and add a pin back to make a country angel pin. You can use paint markers or permanent markers instead of paint brush handle.